The gravitational waves were detected on Sept. 14, 2015 at 5:51 a.m. EDT (09:51 UTC) by both of the twin Laser Interferometer Gravitational-wave Observatory (LIGO) detectors, located in Livingston, Louisiana, and Hanford, Washington. The LIGO observatories are funded by the National Science Foundation (NSF), and were conceived, built and are operated by the California Institute of Technology (Caltech) and the Massachusetts Institute of Technology (MIT). The discovery, accepted for publication in the journal Physical Review Letters, was made by the LIGO Scientific Collaboration (which includes the GEO Collaboration and the Australian Consortium for Interferometric Gravitational Astronomy) and the Virgo Collaboration using data from the two LIGO detectors. Based on the observed signals, LIGO scientists estimate that the black holes for this event were about 29 and 36 times the mass of the sun, and the event took place 1.3 billion years ago. About three times the mass of the sun was converted into gravitational waves in a fraction of a second—with a peak power output about 50 times that of the whole visible universe. By looking at the time of arrival of the signals—the detector in Livingston recorded the event 7 milliseconds before the detector in Hanford—scientists can say that the source was located in the Southern Hemisphere. According to general relativity, a pair of black holes orbiting around each other lose energy through the emission of gravitational waves, causing them to gradually approach each other over billions of years, and then much more quickly in the final minutes. During the final fraction of a second, the two black holes collide at nearly half the speed of light and form a single more massive black hole, converting a portion of the combined black holes' mass to energy, according to Einstein's formula E=mc2. This energy is emitted as a final strong burst of gravitational waves. These are the gravitational waves that LIGO observed. The existence of gravitational waves was first demonstrated in the 1970s and 1980s by Joseph Taylor, Jr., and colleagues. In 1974, Taylor and Russell Hulse discovered a binary system composed of a pulsar in orbit around a neutron star. Taylor and Joel M. Weisberg in 1982 found that the orbit of the pulsar was slowly shrinking over time because of the release of energy in the form of gravitational waves. For discovering the pulsar and showing that it would make possible this particular gravitational wave measurement, Hulse and Taylor were awarded the 1993 Nobel Prize in Physics. The discovery was made possible by the enhanced capabilities of Advanced LIGO, a major upgrade that increases the sensitivity of the instruments compared to the first generation LIGO detectors, enabling a large increase in the volume of the universe probed—and the discovery of gravitational waves during its first observation run. NSF is the lead financial supporter of Advanced LIGO. Funding organizations in Germany (Max Planck Society), the U.K. (Science and Technology Facilities Council, STFC) and Australia (Australian Research Council) also have made significant commitments to the project. Several of the key technologies that made Advanced LIGO so much more sensitive were developed and tested by the German UK GEO collaboration. Significant computer resources were contributed by the AEI Hannover Atlas Cluster, the LIGO Laboratory, Syracuse University and the University of Wisconsin-Milwaukee. Several universities designed, built and tested key components for Advanced LIGO: The Australian National University, the University of Adelaide, the University of Florida, Stanford University, Columbia University of the City of New York and Louisiana State University. At each observatory, the 2 1/2-mile (4-km) long, L-shaped LIGO interferometer uses laser light split into two beams that travel back and forth down the arms (four-foot diameter tubes kept under a near-perfect vacuum). The beams are used to monitor the distance between mirrors precisely positioned at the ends of the arms. 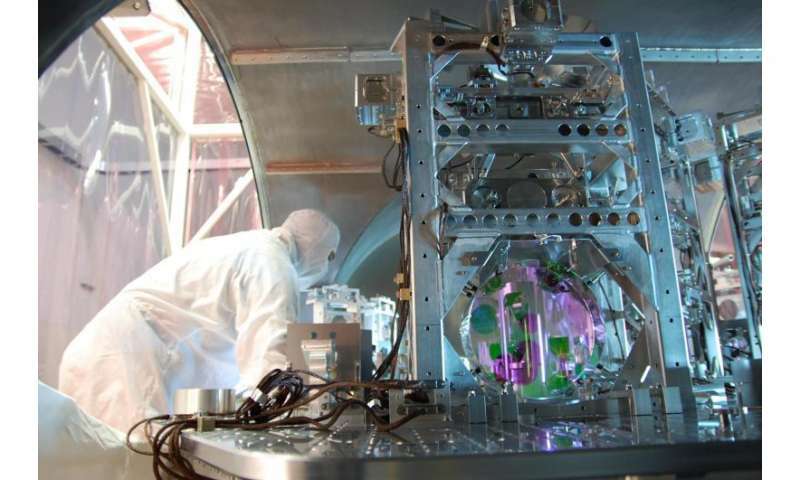 According to Einstein's theory, the distance between the mirrors will change by an infinitesimal amount when a gravitational wave passes by the detector. A change in the lengths of the arms smaller than one-ten-thousandth the diameter of a proton (10-19 meter) can be detected. "To make this fantastic milestone possible took a global collaboration of scientists—laser and suspension technology developed for our GEO600 detector was used to help make Advanced LIGO the most sophisticated gravitational wave detector ever created," says Sheila Rowan, professor of physics and astronomy at the University of Glasgow. If there's a disturbance in space-time, such as a gravitational wave, the time the light takes to travel 4 kilometers will be slightly different in each arm making one arm look longer than the other. LIGO scientists measure the interference in the two beams of light when they come back to meet, which reveals information on the space-time disturbance. The discovery was made possible by the enhanced capabilities of Advanced LIGO, a major upgrade that increases the sensitivity of the instruments compared to the first-generation LIGO detectors, enabling a large increase in the volume of the universe probed – and the discovery of gravitational waves during its first observational run. How do we know it's a black hole? The scientists compared the observation with Einstein's prediction to identify that black holes produced this gravitational wave, how far they were, what the masses were and how large the final black hole was because of the energy emitted. LIGO research is carried out by the LIGO Scientific Collaboration, or LSC, a group of more than1,000 scientists from universities around the United States and in 14 other countries. More than 90 universities and research institutes in the LSC develop detector technology and analyze data; approximately 250 students are strong contributing members of the collaboration. The LSC detector network includes the LIGO interferometers and the GEO600 detector. It includes matching LIGO facilities in Livingston, LA and Hanford, WA. The location of the two observatories with another one in Europe creates a triangle that can verify astronomical observations. LSU Physics & Astronomy Professor Gabriela Gonzalez is the elected spokesperson for the LIGO Scientific Collaboration, a post she has held for five years. LSU Physics & AstronoProfessor Joe Giaime is the Observatory Head of LIGO Livingston. 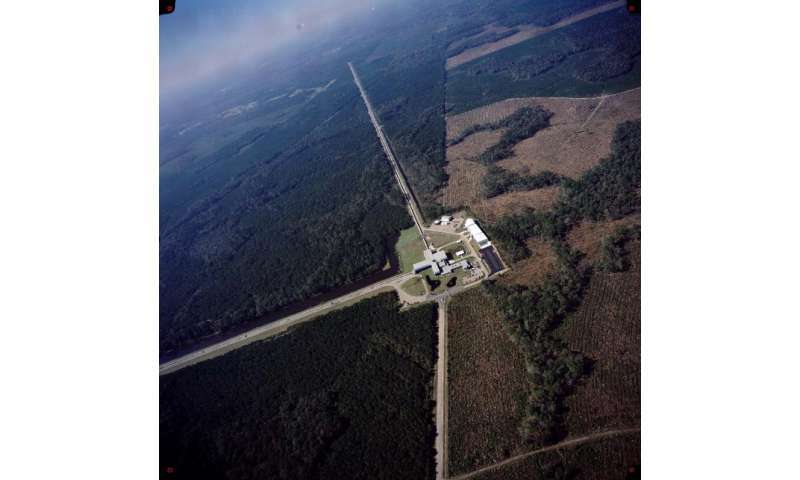 LIGO Livingston began collecting data in 2005. In 2015, it received a major upgrade. The Advanced LIGO configurations increased the sensitivity of the instrumentation ten-fold. LIGO Livingston's annual budget is $6-9 million per year. About 17,000 people from the general public visit LIGO Livingston's Science Education Center each year. Free hands-on educational activities are available for school groups as well as professional development training for educators. Due to (his love for no doubt) Maxwell's equations, Einstein said there had to be an ether, but it was just too infinitesimally small to matter. BTW, downvoting me is not an argument. Well consider my way of letting you know I read your postum. It's an ad-hominem hit and run, a sign of cowardice and moral turpitude. Non it is not. I don't ever make the anti-gay slurs. And why would I be afraid of you? And the moral thing, I might have that and I might not have that I don't know because I don't know what you mean by that. Fine example of an ad-hominem, a sign of cowardice and moral turpitude. ichisan, just becuase gravity affect everything does not mean it can't be modulated at various frequencies. You should know better than that. Ira dude. You got 'ad-hominem' and 'cowardice' written on your forehead. I suppose you think that is going to hurt my feelings. If it was smart it might, but couyons have this strange effect on me, they make me smile. If you got a counter-argument to my objection, let's hear it so I can shoot it down. Yeah, I got the counter-argument for you to object to. Your idea was stupid. I guess it's your turn to choot him down and tell me how smart your objection is. Otherwise, accept that you are gutless. Oh well, I guess you told me good. If it is all the same to you I will just admire your way of putting me in my place. "Ichiban, a fictional male lipstick on the sitcom Friends"
ok I got one... gravity affects everything but gravity waves. And how would galileo know that gravity affects everything? And so where is your evidence corroborated multiply and independently that gravity affects gravity waves? You don't get it. Einstein's explanation of gravity (curvature of spacetime) is self-referential. Gravity waves affect themselves. Why? Because gravity affects everything regardless of mass. Wake up. It's self-referential madness. Pass along my regards to denglish, bscroft, cantdrive hans alfen, reg mundy, Rumpelstiltskin and all the other peoples physorg doesn't let me see anymore. Hooyeei, I wish they would require the trolls to have a minimum level of trolling competence. whereas your argument is... what? Ghost, you obviously love to admire yourself in a mirror. Physics by declaration, eh? Get a grip. 2 separate experiments = multiple independent experimenters. Experiments matching predicted waveforms = multiple independent experiments. The whole corpus of work that has unequivocally matched GR's predictions = many many many independent experiments. You simply choose to move the goalposts whenever evidence supports established theory and not uneducated drivel. And if that's not enough, we have 2 more experiments coming online soon, and more to follow after that. But I guarantee we'll just see more goalpost shifting. Scientists who waste funding on science that is not climate change science are as bad as climate change deniers if not worse. All knowledge about gravity will soon vanish with the human race because not enough money is available for climate change research so scientists like these gravity researches who are in effect denying the importance of climate change should be fired and their funding redirected to climate change research. Just answer my questions sir. How do YOU know that gravity waves are not a special case? Please provide the necessary evidence independently verified. You require it of others, they have the right to require it of you. BTW your argument is self-referencing. Not one of you does. You are all gutless. so... because we don't make sh*t up and then fanatically support it with opinion and not evidence, we are the stupid ones? Stumpy, you can jump up and down and foam at mouth all you want but you have no science to shake a stick at. You just have superstition and wishful thinking. Corroboration is the middle name of experimental science. Get with the program. Besides, science consists of conducting experiments to falsify a prediction, not to corroborate it. This entire super costly fiasco (which it will surely turn out to be) is a sign of the moral turpitude (LOL) of modern big-money science. It's 100% corrupt. They all have heavily invested in this experiment and their self-interest is obvious. You ought to be ashamed of yourselves. Karl Popper is spinning in his grave at the speed of light, as I write. Heart disease kills the most people. By your logic, all doctors should be heart doctors exclusively. No one should investigate MS until Cancer is cured. No one should treat Parkinson's because people can't get heart transplants. There are many sciences, and the intense rigor of science means that you have to really LOVE what you do or else you leave it behind (I did, for example). There's no way everyone inclined to the sciences would all go into climate science, that's just ludicrous on its face. Furthermore, we already have a lot of the scientific knowledge necessary to see the problem, and to fix it. The remaining issues are social, political, and economical, not scientific. ichisan, gravity does not affect everything the same, time is affected differently. THis has been proven with atomic clocks on earth surface and in space. If gravity is not uniformly affecting time, and time is inherent to modulation, then your theory of gravity waves affecting themselves is dead. INDEPENDENT corroboration. Otherwise, it's crap. Get rid of the conflict of interest. Then you can begin to claim science. 747, any physicist worth his PhD knows that time cannot change by definition. The fact that you are talking about time being affected (as opposed to clocks being affected) means that you are clueless. Time cannot change. This is why nothing moves in Einstein spacetime (surprise!) and why Karl Popper called spacetime "Einstein's BLOCK universe in which nothing happens." Source: Conjectures and Refutations. Google it. Again with the goalposts. What counts for you as independent? One person trained in physics and someone who's never read a word on the matter, lest they be biased by previous thoughts? People at different institutions around the world (like the European, Japanese, and Indian observatories coming online)? People at different institutions spread across the same country observing their data independently and finding the exact same signal within milliseconds of each other? So long as you have your Cognitive Dissonance blinders on, you'll keep moving those goalposts until science is something no one can reasonably persue. are you finding literacy hard? or are you simply afraid of the challenges to your belief system? Ah! so it is a conspiracy? at least now we can firmly put you in the "no evidence crackpot conspiracy ideation": group with the eu, jvk and creationists! ichisan, if I spent my time arguing with crackpots, I'd never get anything done. I don't need to convince you, you're welcome to think gravity waves are nonsense or the world is flat or whatever. The world moves on without you. BTW, downvoting me is...a sign of cowardice and moral turpitude. I downvoted you purely because I was feeling overly courageous and honorable, and needed to bring it under control a bit. The first downvote wasn't sufficient, so I downvoted all your post. Now I feel better. but somehow we must accept your POV as you have? and when the above study (article and my references) not only has EVIDENCE, but it matches predictions? does independent corroboration still exist in this little world? As far i understand and can read between the lines, they did not found or see the effects of gravity waves......its only the effects (bugs) off theirs machines. If they can't find those gravity waves (also predicted) in ours own planet system, how the heck would they find those waves millions of light years away!! Its the same as that planet they found a few weeks ago in ours backyard, they found a new planet but they did not seen it yet.......i call that wishfull thinking, thats far from real science!! No, it helps if you see the characters for his name. 後背位 "Mr. Position" is a bit ambiguous; the kana make it much more clear. Now, moderators, CAN THE SPAM! The armchair tinfoil hat brigade that cut and paste their wisdumb on the subject are officially irrelevant. Have a bit of integrity and start deleting their crap alread! Ichi's a very good example of stuff on here that is no kind of debate, just some puerile idiot trying to turn over the table for attention. The problem is that this undeniable principle means that gravity also affect gravity waves. Since these waves affect themselves, they either cancel themselves out or amplify themselves recursively. ... The infinite self-referential regress is too painful to even contemplate. You should actually try contemplating it instead of assuming that to do so would be painful. The self-referential amplification does NOT have to go to zero or infinity. If, for example, the amplification is 10%, then 10% of the additional 10% is 1%, and the additional amplification on that 1% is 0.1%, etc. and the total amplification is 11.1111...% or one part in 9 rather than one part in 10. There - your argument has been countered. About three times the mass of the sun was converted into gravitational waves in a fraction of a second—with a peak power output about 50 times that of the whole visible universe. Don't overdo it with the celebrating, ichi. Bruce Allen, managing director of the Max Planck Institute for Gravitational Physics adds: "Einstein thought gravitational waves were too weak to detect, and didn't believe in black holes." 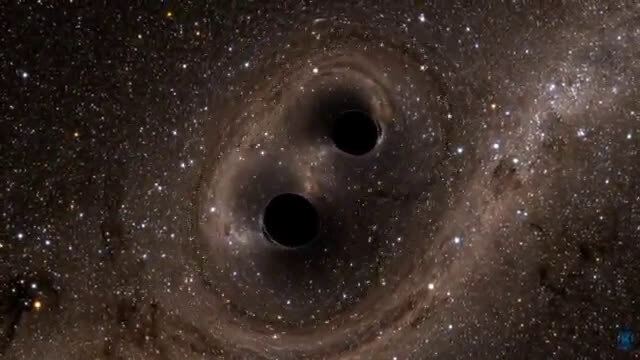 The scientists compared the observation with Einstein's prediction to identify that black holes produced this gravitational wave..
LIGO is non-directional, that is, any conclusions drawn as to origin of the phenomenon is pure speculation. We can't know what colossal event produced that shock wave-front, which is all that it is folks, just the shock wave from a supernova, or colliding black hole, or what have you. Call it what it is. It caused a ripple in space-time. If gravity waves existed, you would be detecting them 100% of the time, all the time, but you didn't. You detected the shock wave from a singular event. That's not a gravity wave. They don't exist. 1 detector is non-directional, sure. But 2 detectors provides 'stereoscopic' 'vision' of an event. More detectors are coming online and once the next 2 (Italy, Japan) come on, we should be able to precisely determine which direction a wave is coming from. While we haven't made other observations to help provide more context for such a wave, its remarkable similarity to the simulation of blackhole mergers is a pretty solid guess. Would we be detecting them all the time? This one, a hugely energetic event, caused a deviation in 1/1000 of a proton radius over 4 km of beamline. (strain of 10^-21) It *is* interesting that according to accounts, this event happened to be recorded pretty shortly after the system began operating, but that could be coincidence or not. We'll need more events to determine some scale of how frequent such waves are. But we can also see that, as an order of magnitude problem, this is the first time we have the sensitivity to see it at all. A change in the lengths of the arms [2.5 miles long] smaller than one-ten-thousandth the diameter of a proton (10-19 meter) can be detected. And if an employee had enchiladas the previous night. I see NiteSkyGerl doesn't have a sense of humour (by rating my masterpiece of humour a 1), ....and doesn't know how to use the Ignore functionality offered by phys.org,... an anonymous half-wit like ichisan from the internet can't possibly effect you unless you want him to. What frequency would a gravitational wave travel on? At 7ms between stations can they calculate the speed of the wave? As far as the time anomaly used to measure, does it take longer for the beam to travel to the detector because the beam is bent and thus longer or does space itself (distance between detectors) change. If so, wouldn't other distances in electronics of the instrumentation change as well and potentially affect results? Sonhouse, you are correct, no G4v. Yours is one intelligent comment here, by the way. All hypotheses of 'electromagnetic and gravitational coupling on an equal footing' just a nice mathematical exercise. Of course one can make electromagnetic to gravitational 'coupling' but it doesn't work other way around. EM fields and waves energy density produces relatively weak gravitational effects, but gravitational fields and waves don't directly produce EM effects. But nothing wrong with pondering and trying. I posted a counter-argument that showed that your argument was wrong. You didn't reply, and I see that you ranked my post, and I also see that two people gave it a '1', so I am guessing that one of them was you. BTW, downvoting me is not an argument. It's an ad-hominem hit and run, a sign of cowardice and moral turpitude. There is no voting, and there is no downvoting. This is not a dominantly accepted concept. So..., not only you will get a 1, since there is no 0, but you also be ignored. This is such a joke! At 10^-19 Meters, the slightest change in temperature, anywhere along the 4 kilometers, could easily alter the distance. There is no way to maintain a constant distance to that high an accuracy over that distance. There could be thousands of possible explanations for this result, not to mention systemic and systematic errors. I warmly urge all readers to stop feeding the trolls. Just give them their fair share of stars, which is 1. And then press the "ignore" button. Evaluating a troll's comment is a courtesy to all other members. It give us all the chance to select and see only comments above a threshold. Choose a threshold of 3,1. My experience says that this works, and it works great. @ichisan: Thank you for giving me a '1' so quickly - it confirms that my guess was correct and that you down-voted my comment rather than posting an argument. I have nothing against someone being skeptical of a discovery until it is independently confirmed, and I don't even mind your failed argument – anyone can be wrong. But you repeatedly insulted people and then you exhibited the very behavior that you accused them of, and when called out on it you simply repeated that behavior. You should have remembered to make your words tender and sweet, for today you get to eat them! "Karl Popper is spinning in his grave at the speed of light, as I write." Do you have independent experimental evidence of that? The way these clowns act, you would think we are talking about a proton collision in a particle accelerator. They are talking about "Black Holes"! The collision between B. Holes would occur over thousands or even millions of years! Not in an "instant"! There would be NO instantaneous signal to measure and if there were a signal it would last for, at the very least, decades. This couldn't be a more contrived and fraudulent claim! You are not a problem solver, you lack creativity, you have accomplished nothing of any technical value. Only a fool expects a comment section about technical articles to be a place for legitimate peer review. Dope. Excellent post! Your link is right on the money! This whole thing stinks as bad as the LHC and their claims around the Higgs. Einstein's theories have been proved wrong so many times, but idiocy, ignorance and stupidity, die hard. Good work ichisan! Keep it up! Scientifically speaking, you are at cockroach level. You"re obviously an American. Scientifically speaking, of course. ichisan and rodkeh, giving each other consolation. The lame leading the blind. One way to force phys.org to do some pest control is to use an ad blocker until they do. Now, if they could just find a way to block stupid. I like how just yesterday the anti Einstein crowd was so confident that today this website would post a bunch of Einstein was wrong hopla. The facts come in and they deny it, who could of guessed? In other words, you don't care if it is true or not, just as long as it says what you want to hear? The theory of relativity provides a perfect architectural frame for why the universe looks the way it does. I have my biases that Einstein was right, but I hardly think that's an unjustified prejudice, every single one of his other published theories has been correct, why wouldn't gravitational waves? the math of relativity dictates it, if gravitational waves don't exist, the whole theory is wrong. Plus there are good philosophical reasons for it, every other force emits waves, why shouldn't gravity? And I don't see how you came to that presumption, I've been wrong plenty of times in my life, the difference is that I admit it and learn from it. Beautiful long big difficult work, which opens the new astronomy with gravitational waves !! The anti Einstein crows must stop cawing ! As far as the time anomaly used to measure, does it take longer for the beam to travel to the detector because the beam is bent and thus longer or does space itself (distance between detectors) change. That is a good explanation. Thanks for taking the time. It really is worth the 10 minutes it takes to read it. Choot, you will probably waste that much time reading these silly comments. NVM, just saw the follow on posts. I think this is great for two reasons. If these results are repeated elsewhere it's not only another mark up for Einstein GR but other experimenters will quickly get funding (well, probably) for other experiments on gravity and space-time. Also , to me, it seems we will learn more about gravity and perhaps in the future be able to use it for all manner of things. If the results cannot be repeated then scientists will still have learned something not least being able to produce high precision instruments. Please do not link to places that others cannot open; I will not open a Quora account. So two blackholes with a combined mass of 65 solar masses merge and in the process give up three solar mass's of information, I thought nothing could escape from a BlackHole? What country should I be from instead? Steve, why do you ask? Do you want to know who to impersonate? You really have no concept! You think 1.3 billion light years is is relatively close by! it's less than 1/10 of the universe's age, it's close enough, considering the vast majority of the universe is beyond that threshold. Oh... I just realized you've been hung up on the comment when I said "y'all" hahahaha, how trivial, don't you appreciate Mark Twain? Not surprising, but exciting as it adds another much needed perspective. There's nothing quite absolute as gravity, so I suspect as we learn about it, it will add precision to existing methods and abolish and modify a number of theories. But gravity remains the main problem. Newton's law the force between two objects is equal to the gravity constant times the mass of object 1 times the mass of object 2 divided by the distance between the two centers holds well for solar system scale, but I still believe there is collective mass gravity; why else would are galaxy head towards the virgo cluster (an extremely dense cluster). Collective gravity would not defy Newton's gravity because it would reflect the center of each mass within the collective. The result is not gravity across the galaxy, but instead acting as a string. How is difficult to explain. One final critical aspect I atroshishly forgot to mention is that collective gravity is relative whereas newton's is absolute. For that reason, it is possible to explain how we are attractive to the virgo cluster because relatively speaking the collective masses within the virgo cluster outweight our distance to it. The more I think about, the more I hate that newton's equation is absolute. Something imprecise could be true on the small scale, but completely wrong on the large scale. Of course, referencing one part of the Milky Way neglects density variations between it and the outer arms. Gravity isn't magnetism, it is solely determined by mass. That is not a logically valid inference. It assumes that what you refer to 'everything' regardless of mass must include gravity waves themselves but give no premise for the assertion; ...unless you say "Because gravity affects everything regardless of mass" IS the premise in which case your argument is circular thus logically invalid. I should also point out that there is currently no empirical evidence that suggests gravity waves 9or just gravity in general) can effect themselves. the relatively low force of gravity compared to the other three forces could be explained by how gravity and dark matter interacts with one another with gravity being a much stronger force with the absence of dark matter. How? Dark matter also creates gravity, it does not weaken it. And you don't need to go to space to appreciate the extreme differences between gravity and the other forces. Think about this: You need a whole planet of mass-energy to accelerate you just 1g. But Electromagnetic force can do the same to you with a tiny amount of EM force, up to the point it can be stored in the battery of an electric car. However, EM will soon be exhausted (transformed into Kinetic energy), while gravity not. Basically if space is saturated with dark matter then dark matter should have absorbed the gravitational energy while traveling through space reaching our planet but this find suggests it didn't so what is dark energy? Perhaps someone can confirm that these waves have an initial amplitude and something in between dampens it? Einstein's explanation of gravity (curvature of spacetime) is self-referential. Gravity waves affect themselves. Why? Because gravity affects everything regardless of mass. Wake up. It's self-referential madness. Your objection stems from simple semantical confusion. You might as well complain that waves on a lake are impossible because the curvature of the surface affects everything on the surface, so the waves should make themselves wave, which is in fact what they do as they propagate. Gravity waves are gravity in the same sense as water waves are water: the waves aren't a thing like a particle, much like how a shadow of an object isn't a thing, hence why there's no problem for a shadow to be e.g. moving faster than light, or a wave to be propagating itself. They aren't concrete things but phenomena arising from things. So your argument is based simply on confusing the concrete with the abstract on the level of language. More precisely, in the Einstein's prediction, the curvature of space is a result of mass acting on it, and the gravitational waves are simply a result of the fact that information cannot travel faster than light - therefore the changes in the curvature of space have to propagate at a finite speed. The gravity wave that propagates is a result of the information of the curvature-causing event propagating through space in the same way as how a wave on a lake is a phenomenon of energy propagation. If you wiggle a massive object in space and observe the universal speed limit for information, or any speed limit at all - by logical consequence there must be gravity waves. You can even forget about Einstein's idea that gravity is curvature of space. For any means of conveying gravity, if there is any speed limits at all, there must be waves. If there aren't speed limits, then the universe would be over in a snap. For gravity to act instantly over distance produces the same problem as with the question of why isn't the night sky white? The idea is that if the speed of light was infinite, the sky would be brilliant searingly hot white with all the light from all the stars. It isn't, because all the light hasn't had the time to propagate from everywhere to this point, and much of the universe is receding away faster than the speed of light which means it never will. In the same way, if gravity was instantaneous over distance, we would feel the weight of the entire infinity of space filled with stuff, here, right now, and would get ripped apart instantly because of all the mass surrounding us would far exceed the humble pull of the earth and the sun, and even the forces that hold atoms together. Technically it is directional. The branches lay in a plane, and gravitational waves coming in perpendicular to the plane won't change the distance of the mirrors, so any off-plane waves produce an attenuated signal. Due to the sensitivity limits of the device, it can only produce a clear signal for events coming in at a relatively low angle to the detector plane, and therefore with two detectors with intersecting detection planes, you have a pretty good indication of direction. If you have a signal in both, you can be sure that it's not coming from a direction perpendicular to either of the detectors, nor from where the detection planes diverge, and that rules out a great deal of the sky. You can triangulate where it's coming from. If you habe just two detectors then that gives you a circular patch of the sky. From the orientation of the L shaped arms of the two stations you also get some directional information because the signal is attenuated differently depending on whether the wave goes head-on through one of the arms or at an angle. In the end they came up with a probability map for that semicircular part of the sky. Even with more detectors it will be hard to get perfect pinpoint accuracy because noise always plays a big role. Is there anyone out there, who could explain me how, from the recognised vibrational signature for the merger of two black holes, what is clear to me), it is possible to know how far away / long ago the event happened? Can one also know where? The amount of mass per volume of space increases faster as you increase your distance from center, than the diminishing effect of gravity by inverse square law. If you add up mass at a distance x from earth, the amount of stuff - assuming roughly even distribution of matter - increases proportional to x^3 whereas the influence of its gravity diminishes by 1/x^2. So x^3 amount of stuff divided by x^2 still leaves a net force of x, where x tends to infinity as you allow gravity to act instantly across all space. Is there anyone out there, who could explain me how, from the recognised vibrational signature for the merger of two black holes, what is clear to me), it is possible to know both masses as well as how far away / long ago the event happened? Can one also know where? Question: if the sun changes direction suddenly (think on a giant solar flare in the far side as propulsion mechanism) would the earth also change direction instantly or will it contiinue in the original orbit for another 8 minutes? Well, the sun wouldn't change direction quite instantly, but yes, the difference in the sun's position wouldn't be felt on earth until about 8 minutes later. The question of "original orbit" is a semantic error, because the two locations - sun and earth - don't experience the same reality at the same time because information travels at a finite speed. From the sun's point of view, the earth's reaction to changes in gravity occur 16 minutes later, while from the earth's point of view the sun only starts moving at minute 8, so neither can really agree what happened when and where. Reality in either point is subjective to that point, and we can only talk about it because we imagine ourselves to be an all-seeing "god". The difficulty in understanding relativity is in understanding what reality is, and that's not intuitive when we think in the abstract. Reality is what you know is, right here and now. By knowing I don't mean intellectually, but in the concrete sense: photons from the sun hitting your face and the seat pushing up against the back of your pants. That's the information you have here, and that defines what is real to you. So when we think of objects at a scale where relativity starts to matter, we get confused about what we consider to be real. We try to think that there exists this thing that includes both the earth and the sun, which contains the information about where the sun and the earth are relative to one another. But no such entity exists except in our imagination. The only reality that does exist is the subjective reality of the sun and the earth, separately, both having an independent idea of where things are depending on the information about the other things. IMO if it would move instantly, the Earth would also change direction instantly. That statement requires one to imagine that there exists an absolute reference frame where information travels instantly, which would break causality because we would then be feeling the earth move before the sun moves from our reference point. In other words, effects would happen before their causes and nothing in physics would make sense. It is interesting, that they have searched the supposed area of gravity signal source, but have found nothing in astronomical data. If there are more and more gravity signals over time and they would still not found any gamma ray or other visible source at the same time, it could mean that the speed of gravity is different than c.
The exact distribution of masses are arrived at by best fit of curves from theoretical models. It is interesting, that they have searched the supposed area of gravity signal source, but have found nothing in astronomical data. Interesting but not really surprising. Closely inspiralling black holes have no stable orbits for accretion material between them, so there's nothing that could be heated that would give off intense radiation. The inspiraling black holes could have a combined accretion disc.. But we know from other observations that black holes feed in bursts - with quiet phases in between. If the black hole binary was in such a quiet phase then there would be no accompanying visible signal. Then there's the issue that even if there was a jet/burst it might not have been directed at us. There's a lot of directions it could have been pointing without being visible from Earth. If the black hole binary was in such a quiet phase then there would be no accompanying visible signal. Seems like good explanation. But it is strange that we have so many gamma ray bursts observations and some of them are probably merging black holes and we have only one gravitational wave signal since september 2015 from quite long distance of 1,3 billions ly. Based of astronomical data, there should be hundreds of gravitational waves observations from black holes mergers which are closer and bigger than that. Something is wrong or something major is missing in the current explanation. Due to LIGO asymmetric geometry it has different sensitivity depending on the direction of the waves, and also depending on their frequencies. There can be privileged events like this, even if others are more powerful. Also, events of this nature are much less frequent that you seem to think. Not bad explanation, but when we compare gamma ray bursts which are detected around one per day and this one GW per 4 months, it is still questionable. Because GRBs are based on narrow jets which have to be directed towards Earth. So if we take that aLIGO needs a specific angle and detects only mergers of black holes from 20 to 100 sun masses, there still should be at least one per day detection. Because even in that narrow angle there should be many merging black holes, if it can detect them from distance up to 1,3 bilions of ly. "the event took place 1.3 billion years ago." "the detector in Livingston recorded the event 7 milliseconds before the detector in Hanford"
When the event occurred apparently depends on the assumption that the speed of propagation of a gravitational wave is the speed of light. If this is true the expansion of spacetime would be equivalent to the speed of propagation of a light wave of very low frequency. But spacetime expands about 3 times the speed of light so I would think the speed of gravity would be about this speed. In which case the event would have taken place only about 0.4 billion years ago. Based of astronomical data, there should be hundreds of gravitational waves observations from black holes mergers which are closer and bigger than that. Something is wrong or something major is missing in the current explanation. and that constrained to certain directions. Bigger mergers produce lower frequencies than LIGO can detect. Smaller mergers produce higher frequencies than LIGO can detect. The sensitivity is juuuust about enough to detect anything with the certainty needed for a positive identification (And that is a MAJOR feat given the size of the signal). As more and more sensitive detectors come on line the picture will change. If this is true the expansion of spacetime would be equivalent to the speed of propagation of a light wave of very low frequency. Whut? Wherever did you get that idea? Thank you for the answer. OK for the masses, I'll live with that. Still unclear how to derive the distance/time: strong and far = weak but nearby? When you know the masses (which you get from the ferquency part) you can model the amplitude of the signal at it's source. Signal drops of with distance squared. From the amplitude of the received signal you can then calculate the distance. The paper published yesterday in the Physical Review Letters entitled "Observation of Gravitational Waves from a Binary Black Hole Merger", is an easy read and people with a moderate scientific literacy should be able to extract a fair amount of information from it. The Wheeler-DeWitt Equation shows that "Time" is not real, but merely a metric by which we track relative motions induced by charge interactions at the quantum level, which also is carried into the larger scales by choosing arbitrary reference cycles (i.e., Earth's rotation, orbit, etc.). "Spacetime" then is not a fabric or substance, though "Time" arises from motions in space. The dilation effects of SRT (special relativity theory) come from observing the rates of information transfer as seen from observers traveling at different velocities relative to the velocity of the light that is carrying information, say, digitally coded into a light beam. Metrical representation is a mapping of motions relative to one another. Natural cycles can be chosen to serve as clocks to order events. Memories and sensory data-flow give the illusion of an "arrow of time." The "past" is a memory, and "future" events are projections from expectations based on physical forces and human behavior. The detection was made on 14 September last year and the waves were produced from the collision of two black holes of 36 and 29 solar masses, respectively, which merged to form a spinning, 62-solar-mass black hole, some 1.3 billion light-years (410 mpc) away in an event dubbed GW150914. What happened to the other three solar masses of information? How did 3 solar masses escape their respective Black Holes? Whether "space" physically interacts in a gravitational field or not does not address the problem that the non-Euclidean geometry of the general theory of relativity is self-contradicting. Even if Einstein is correct that "space" does interact in a gravitational field or near massive bodies, his statement that "in the presence of a gravitational field the geometry is not Euclidean" cannot be correct if that non-Euclidean geometry is self-contradicting. I found somewhere the size of the observable U is 93 bly which I take as a diameter. Divide this by 2 to get a radius and then divide by the age of the U.
I can't for the life of me see how you can get the direction of a GW with only 2 interferometers. As I estimated about 3c. ... the non-Euclidean geometry of the general theory of relativity is self-contradicting. They were blown away in the energy of the gravitational field. The Republican National Committee has denied the existence of gravitational waves. The RNC says that this is just a liberal plot to confuse people who know nothing about science, namely Republicans. The Republican-led Congressional Science Committee agreed, saying "If God had meant for there to be waves in space, He would have put an ocean there." The Reverend Pat Robertson added to the argument by claiming that no one has ever seen an astronaut surfing (if there were such a thing as an astronaut); therefore there are no waves in space. So if we take that aLIGO needs a specific angle and detects only mergers of black holes from 20 to 100 sun masses, there still should be at least one per day detection. The problem with that logic is GRBs aren't believed to be from 20 to 100 solar mass black hole binaries. The most common mode for short GRBs neutron star-neutron star, which are much less massive and hence aren't detectable at such distance. LIGO has other candidate events in the science run, this was just the first one. Two merging black holes would have emitted an enormous burst of neutrinos, how come we haven't seen reports of their detection. Huh? By what mechanism would they create neutrinos? The human mind is a mysterious place and we have much to do to understand its mechanism. The one thing that is obvious about it, especially if you are amongst Physorgs's frequent comment readers, is that when some ideas come in conflict with ones inner world, it has a strong resistance against them and they will likely be rejected and it is alright; this is partly what gives us individual identities. The funny thing about it is that there are people who reject some scientific ideas that come on a website that publicise scientific knowledge to rebel against them. They kick and stump like terrible twos, as if these tantrums would somehow change our own life long accumulated experience. Sorry, it is not that I do not care about you; it is just that I do not care about your way to think for I am very receptive to science; this is my very own personal wealth in the sense that it has a strong influence on my personal values. There is one thing that is very distinct about scientific minds is their quest to understand things and their willingness to help others who want to understand; that is called science outreach and it brings great minds from all over into international collaborations and aLIGO is a wonderful example of that and thanks to them, the era of gravitational wave astronomy begins. Thank you very much for that Zeph, it goes right along the lines I wrote earlier. The Republican National Committee has denied the existence of gravitational waves. I understand there is also a problem with global warming. My advice would be to build an ark. [If God had meant for there to be waves in space, He would have put an ocean there. But what if God really did leave such an ocean for us? I understand they call it the Dirac Sea. ,,. the gravitational waves itself don't imply that the vacuum is elastic at the large scale. Gravitational waves or not, I don't think anything in nature would be perfectly inelastic. That would violate the uncertainty principle for one thing. Thanks promile. This ends the debate on whether gravitational waves propagate with the speed of light: they do. Really? Per his reference, "Future joint observations of GW events by LIGO/Virgo and Fermi GBM could reveal whether the weak transient reported here is a plausible counterpart to the GW event GW150914 or a chance coincidence,..."
The paper was interresting but unconclusive. It will be much more interresting once aVIRGO will be listening along with aLIGO. Sometime this year and they will be active for a six months of observation and with the Gamma Ray Observatory on watch too. The 3 solar masses *are* the gravitational waves, so to speak. That's how the energy was dissipated. Anyone here help me on a point. The 3 solar masses lost were converted into the energy of the GW. Just exactly what are we referring to here? If any solar masses are converted to energy I would be thinking in terms of E=Mc^2 (radiation etc) Am I to interpret that a GW is another photon? (I don't mean graviton). I thought that would be wrong since if that was the case there would be no problem QM and Grav. some what more than 4 years ago I took an interest in gravity, it did not lead me to where I expected to go. It left me with time on my hands or to be more specific a total lack of time. How does this confirmation confirm the existence of gravity when Einstein describes it as the bending of space time. How and according to what can be synchronized physical properties of the elementary particles and their energetic interactions in two distant points in the universe without absolutes that are unchangible in space and time - constant for the whole volume and history of the universe? How elementary particle can understand that the speeds with which interact physicaly with other particles are constant, in order to maintain the established order in the universe? How can be ensured without absolutes that the power and the ratio between the fundamental forces in nature are constant will be independent of location and time? What is ensuring the consistency over time of the physical laws that are embedded in the foundation of the physical reality? The time is one of the absoltutes, according to which are defined the speeds of the physical interactions between the bulding blocks of matter. GR is like the theory of some mathematical interpolation curves called splines or rational B-splines, which are defined by control points with defined weight which pool localy the calculated points of the curve. These weight have local gravity which have noting to do with the physical world, but only with 2, 3 or n dimensional geometric world. Whether you want to call "matter" what is inside, I have no clue. Matter isn't really stabel inside the event horizon. To have something like an atomic nucleus stable (or even the quarks within a nucleon) you have to have interchange of nuclear force carriers. but since these are limited to the speed of light they can only interchange in one direction leaving the nucleus/nucleon unstable. Whether electrons or quarks will decay or remain stable is a bit of a poser, though. To an observer inside it is business as usual, so matter should look normal. I think that observer would not be alive (due to the aforemntioned stability argument). What you see as an outside observer is the last photons of the clock hitting that last second before it crosses over stretched to infinite slowness. But that doesn't mean the clock doesn't pass. I believe an observer crossing the event horizon would not notice anything peculiar for a while depending on the size of the BH ,…. but eventually due to tidal forces would be torn apart,… and then the energy of the atoms of observer would transform into the space-time geometry itself,… and eventually into the singularity which is ill defined. Maybe QM would prevent this scenario. @promile & Phys1, thanks but here's my problem. If GW are composed of 'photons' and given that particles can decay into, say, gamma rays and vice versa, is there a suggestion that GW 'photons' could do the same? Secondly, if the former is so could we therefore conjecture that there would be an anti partner too? And if there were an anti partner since gravity is largely responsible for BH's could there be an 'anti BH' (I am not referring to WH's)? To an observer outside nothing ever crosses the event horizon. I've been trying to think of an easy way to explain this since a lot of people seem to have an issue with this seeming contradiction. It's actually no different than some star falling over our observability horizon due to cosmic inflation. We see that star receeding into the infrared until we get no more light from it at all. But that last receeding is stretched out to infinity (and, just like in a black hole, becomes infinitely dim very fast, since the number of photons is not infinite). Moderate that with your control freak bureaucracy. While you getting a majority vote to submit to the next level for consideration then advising an administrator, we'd all have forgotten about the post. Your suggested system is unworkable. As the system stands the spam above will be gone in a few hours. Or you could add the poster to a growing list - lol. Add this to Phys1 pathetic list. So black holes, from which, by definition, nothing can escape, now "emit" energy in the form of gravitational waves? Such energy being produced by the conversion of mass to energy? May one assume there's a coincident reduction in the mass of theses black holes? And exactly how may angels need to dance on the head of a Cheshire cat to make all of this happen?